I have two projects I wanted to complete this summer. First is getting rid of the stippled ceiling in the bedroom. Second is redoing my bookshelves. Given my lack of success last month with the ceiling, I think both of these tasks are going on the August list. You’ve already heard about the ceiling, so how about a little bit about the bookshelves? (Yes, this corner has looked like this since we moved in more than two years ago). My Dad and I made these bookshelves for our first house. They’re shallow, so they don’t take up much space. They have adjustable shelves, which is handy. They’re going to work well for us here with just a few tweaks. First on the list is cutting down one of the shelves. It’s twice as deep as the others because it held our TV back when it was a giant square box. I figure I can get two bookshelves out of this one. Second on the list is putting another bookshelf back together. It was damaged in our move and is pretty wobbly. Then, I plan to add some trim and paint everything white. I’ll replace the adjustable shelving tracks with white ones and set the shelves in place. 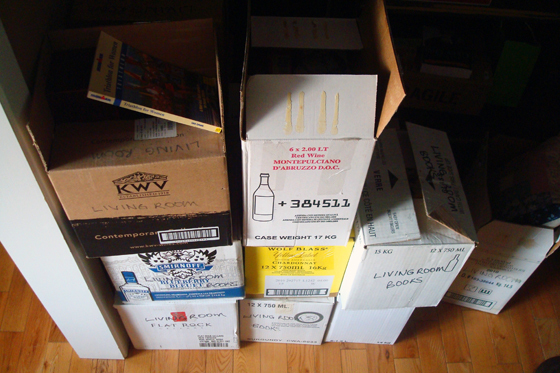 Then it’s on to the best part: loading the shelves. 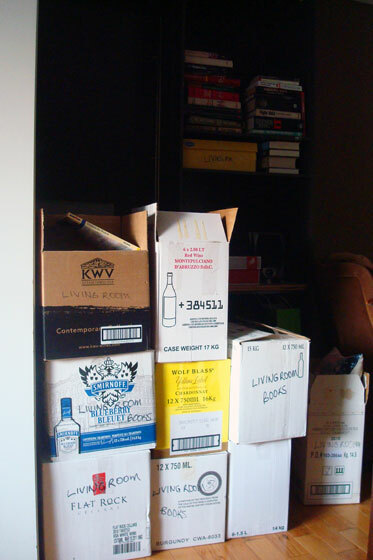 My books have been packed away for more than two and a half years. I want them back. Two years is too long to wait! I feel your pain. I feel like I’ve been separated from my friends! That’s true. I hadn’t considered that as one of the reasons I’ve been dragging my feet on the ceiling.